The LHCb collaboration has spotted a new particle. Its mass and other properties place it squarely in the charmonium family that includes the better-known J/ψ particle, which was the first particle containing a "charm quark" to be discovered and won its discoverers a Nobel prize in physics. Future studies of the properties of this new charmonium state and its relatives will help physicists better understand the strong force that binds together quarks, among the smallest particles that we know of. Charmonium particles are two-quark particles (called mesons) composed of a charm quark and its antimatter counterpart, the charm antiquark. Charm quarks are the third most massive of six quark types. Just like atoms, mesons can be observed in excited states of higher energy, in which the mesons' constituent quarks move around each other in different configurations. These different arrangements give rise to a gamut of particles with different masses and quantum properties such as spin, which can be thought of as the rotation of a system around its axis. Observing such excited states and measuring their properties provides a way of testing models of quantum chromodynamics (QCD), the theory that describes how quarks are stuck together into composite particles. What's more, knowledge of the full collection of these states helps identify exotic states with more than three quarks, such as tetraquarks, that are also predicted by QCD but have only recently been discovered. If all of the excited states are accounted for, physicists can be more confident that any remaining ones are exotic. 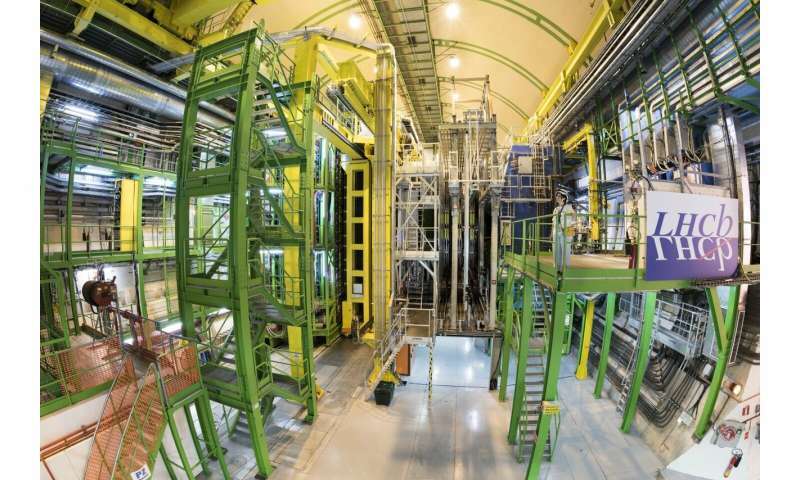 To catch the new charmonium particle, the LHCb collaboration, one of the four main experiments at the Large Hadron Collider, studied the decays of charmonium states produced in proton–proton collisions into pairs of D mesons, using data recorded between 2011 and 2018; D mesons are the lightest particles containing charm quarks. The collaboration measured the range of masses of the D-meson pairs and then added up how many times they recorded each mass value within the measured range. They then looked for an excess of events, or bump, in this mass distribution, and found a new, narrow peak at a mass that corresponds to a previously unobserved charmonium state dubbed the ψ3(1D). The particle has a spin value of 3, making this the first observation of a spin-3 charmonium state. The high spin value could account for the peak's narrow width and the fact it has taken so long to find.